Komphela – Derby like a Cup Final! Maritzburg United coach Steve Komphela is preparing his team for the most crucial battle of their 2014/ 2015 campaign. United take on AmaZulu at the Moses Mabhida Stadium, looking for a result that will keep them above Free State Stars and in the top eight bracket. Stars, equal on 37 points with Maritzburg, host Black Aces at Goble Park. Komphela is wary of the threat of his former club Stars, and also acknowledges how vital the KZN derby is to AmaZulu as well, making for a winner takes all scenario. 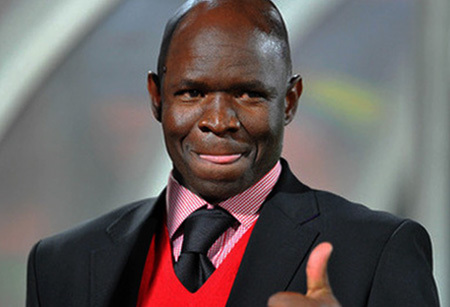 “It’s amazing, they are on a hell of a run,” Komphela was quoted as saying on the SuperSport website. “It’s now five [victories] in a row; unbelievable. Nobody saw this coming and good for them. “That puts the pressure on us because we are now tied on points. The only things in our favour is the goal difference (Maritzburg are on +4, Stars -5). Now unfortunately we are in a situation where we have to get a result at AmaZulu. As Komphela points out, it’s been a highly competitive Absa Premiership season throughout.